I also found a neat feature that automatically uploads your pictures to SkyDrive. I will now have all my pictures backed up to the web in case I lose my phone and can easily share them. 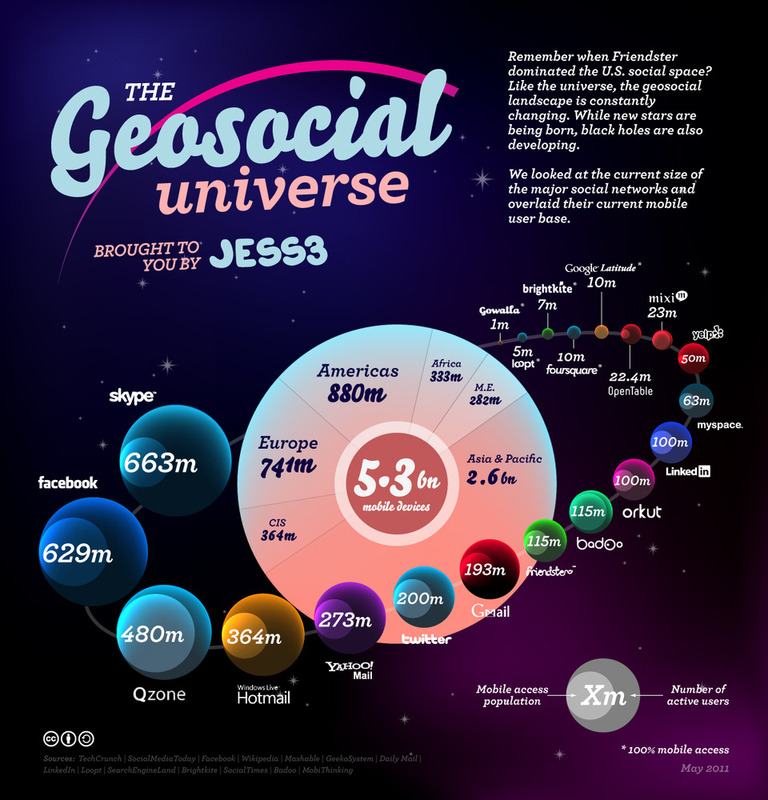 This great infographic has been recently updated and shows the numbers of mobile users as a proportion of their overall userbase. Of particular interest is Skype who have recently been acquired by Microsoft. An estimated 663m Skype users have mobile access higher than any other service including Facebook. There is definitely a valuable user base there for Microsoft especially as we know that there will be a Windows Phone 7 version coming when the Mango update is released. Where would BlackBerry’s BBM be on this map? Power Monkey – A gadget everyone should have! I purchased a Power Monkey Classic v2 from www.firebox.com last year to charge my power thirsty iPhone 3GS on the go as its battery lasted 12 hours before it died. It is a device that you can “charge up” and connect to your phone or other gadget when you require power. It quite capably recharged my iPhone to full capacity. The iconic powermonkey-classic: a charging device that’s become one of the most widely recognised and versatile portable chargers available on the market today. Having switched to a LG Optimus 7 running Windows Phone 7 I have had less of a need for charging on the go and this great gadget has been lying collecting dust on my desk. On a few occasions in the past few months I have been on a train home after using my phone to tweet, call people and check email all day and the battery has run out of power. I have had to use a phone box to get someone to pick me up. About an hour ago I thought I would have a look at the many connectors that came with this unit and I found a micro-USB attachment for my phone. The Power Monkey also has interchangeable plugs so you can use it in different countries. What a great product, light, durable and it charges everything, it even has a USB connector to charge the Power Monkey from your PC! I highly recommend this and encourage you to throw something out of your laptop bag for this. A fixture on BlackBerry phones and such a simple feature. I am wondering why manufacturers have removed this from handsets as this surely extends battery life. When I receive a text or have missed a call the indicator flashes red otherwise it flashes green to show you have network coverage. This saves having to switch the full phone screen on to check your texts etc. and wasting precious battery. NFC, or near-field communications, is a way for two devices to communicate small amounts of data when they’re placed about four inches apart. This technology is already beginning to appear on handsets namely the Samsung Nexus S, upcoming BlackBerry Bold 9900 and rumours that it may appear on the next iPhone. This would allow you to buy items by hovering your mobile phone over a NFC enabled terminal. Emerging NFC applications include mCommerce, P2P payments and electronic keys. This technology would allow transactions between merchants to happen faster and the reduction of queues at stores and events. NFC requires adoption by manufacturers on their handsets so the potential of the technology can be utilised. The camera technology that can be found on mobile handsets has come a long way in terms of quality. I am hoping that one of the new Nokia Windows Phone 7s has a camera that is better than the one found on the Nokia N8. This unit has an outstanding camera boasting 12 megapixels, xenon flash and a Carl Zeiss lens (here are some pictures taken using the N8 http://bit.ly/lvd8EF). My dream Windows Phone 7 should also be able to take 1080p HD video too (maybe even in 3D). I want to take great photos and videos as my phone is always with me. Having been initially wow’ed by the brightness of the AMOLED screen on the Samsung Omnia 7, I thought I want this display? But the the awesome Retina display in the iPhone 4 and more recently I have seen the Super AMOLED Plus on the Samsung Galaxy II are far superior. My dream Windows Phone 7 has to have something equivalent to the Retina and Super AMOLED Plus displays. Here is a great link to compare these screen technologies: http://bit.ly/keRrdr The screen should naturally be protected by Gorilla Glass http://bit.ly/kzN4OR which most handsets appear to have now. Whilst Quad Core is all the rage on desktops, Dual Core seems to be the answer on mobile phones. There is NO dual core Windows Phone 7 handset available at present and I have not heard any murmurings of upcoming models either. The upcoming hardware acceleration support in Mango will benefit from faster and multi-core processors. The iPhone 4’s thickness of 9.3mm is really impressive and it sets the standard in terms of its compact design. The Samsung Galaxy II is thinner still but I prefer the robust and heavier feel of the iPhone 4. External removable storage through a microSD expansion slot is something that with faster networks, the ability to create documents, record HD video and play music should be compulsory. You cannot save and retrieve everything to/from the cloud over your 3G connection, think of your data costs! With Microsoft’s recent acquisition of Skype, I am hoping that it should be almost guaranteed that we see front facing cameras to allow video calls on Windows Phone 7. Both iOS and Android allow you to turn your phone into a WiFi hot spot so your friends can surf the net or you can get your laptop / tablet online. This would be a great and very simple feature; although no charge for tethering is most likely only going to happen in my dreams. Many of the handsets out there now are able to record video in HD and stream HD content. The LG Optimus 2X already has the ability to connect to your HDTV to play games and drive 1080p HD videos. The gaming element is really important here as Xbox Live gamers could play higher quality games that are more immersive with their friends without the need for a console. The sound element of mobile tends to have been neglected falling behind many if not all new features. Dolby are looking to get 5.1 channel HD audio into the mobile world with their “Dolby Mobile” technology http://bit.ly/kA4A9U This will add richer sound to mobile gaming experiences and coupled with HDMI will mean the sound matches up to the picture quality on your phone and HDTV. All of my dream features are going to require power. The handset should aim to not require a charge every 12 hours. I would like to make 2-3 phone calls a day and play some Angry Birds and still have at least 50% left. I was very tempted to add 3D capability as a feature I wanted to the AMOLED screen but having seen the Nintendo 3DS and the Optimus 3D http://bbc.in/iq3Xv8 I am not yet convinced by 3D on smaller devices. 3D may be more suited to next-gen tablets due to their larger screens? Come on Microsoft, HTC, Nokia, LG and Samsung et al. I want to see some new Windows Phone 7 handsets so I don’t look so green with envy at all my friends with their iPhone 4s and in particular the amazing Samsung Galaxy II. What if RIM “did a Nokia” and decided to adopt the Windows Phone 7 platform? After the recent announcement that Bing Search and Maps will power BlackBerry phones and the new PlayBook could there possibly be a deeper tie-up on the horizon? RIM have a strong user base but are losing the battle against iOS and Android in terms of acquisition and producing applications for the BlackBerry can be difficult. On the other hand, Microsoft are looking to maintain the current momentum of the Windows Phone 7 platform that has come from recent announcements and analysts predicting strong growth in the coming years. A deeper partnership between RIM and Microsoft would favour the new entrant more rather than the old. The reasons Nokia chose Microsoft over Google are all very relevant if RIM made the same decision. RIM would enjoy lower core platform development costs if they were to move to Windows Phone 7 as Microsoft would own the development roadmap. If they decided to transition their applications to Windows Phone MarketPlace they would have lower operational costs and could potentially phase out BlackBerry AppWorld. As a development platform Windows Phone 7 is less fragmented than Android. BlackBerry development is time consuming due to the handset models and variants across regions as well as carriers. Office and SharePoint integration would suit RIM’s existing corporate user base. RIM would have an army of willing Microsoft based developers and a strong community. RIM would possess a smartphone user experience which rivals Android and iOS. The Microsoft ecosystem is more complete than that possessed by RIM presently (Stephen Elop made reference to mobile ecosystems) BBM would make a great complement to Bing, Xbox Live and Zune. The Windows Phone MarketPlace already has an increasing number of applications that RIM could take advantage of straightaway. What are the potential risks for RIM? alienate the existing large user base who like the current style of handsets and BB OS. Steps would need to be taken to avoid upsetting these users. reduce the likelihood of existing BlackBerry developers committing to writing for Windows Phone 7. RIM would lose complete control of their phone platform in terms of feature development. A partnership with Microsoft would put a question mark over the PlayBook. This is running the new QNX platform which is a big deal for RIM. Could the PlayBook play in the same space as the upcoming rumoured Windows 8 ARM based tablets? What would happen to QNX? I think RIM’s current dual CEO role could be put under stress if such an option was to be undertaken. What would Microsoft be thinking about? Microsoft are already in a better place after their tie-up with Nokia but having another name like RIM associated to the Windows Phone 7 stable would give a further boost in the battle with Android and iOS. RIM would be bringing a large BlackBerry user base to potentially adopt the Windows Phone 7 platform, for Microsoft this user base would compliment Nokia’s strong position in emerging markets. The integration of RIM’s “Killer App” BBM on Windows Phone 7 and how access to this highly engaged and social user base could bring in revenue. Microsoft would need to think about how to address any conflicts of interest between RIM, Nokia and other hardware partners. Like Nokia, RIM have years of mobile experience specifically expertise around hardware and Microsoft should be looking at how to learn and make better decisions based on this experience. It is all about volume and the opportunity to have more handsets on their platform would be the biggest win. RIM continue as they are and compete against all the other players in the market alone. RIM partner with another platform for mutual benefit e.g. Microsoft or Google. Microsoft or another player (Google) look to acquire RIM. Based on the nature of the Nokia and Microsoft partnership clearly the partnership route is less risky (for both parties) and more palatable for companies like Nokia / RIM who have a more established presence in the mobile marketplace. 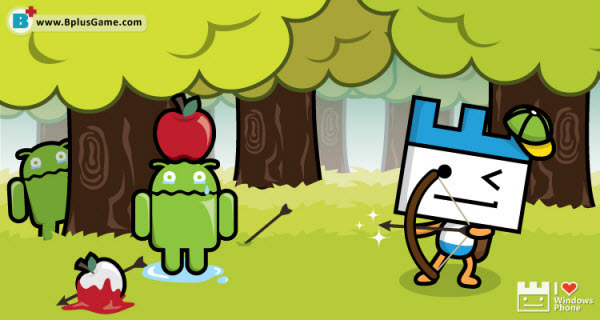 If RIM chose the Windows Phone 7 platform the battle to be the world’s no.1 mobile platform would be a three-way fight between Google’s Android, Apple iOS and Microsoft’s Windows Phone. I thought this was quite cool although not in line with WP7 branding 😛 Although this graphic is not based on recent analyst predictions for Windows Phone 7 versus iOS and Android.